The classic banter and charming rapport of the comedy duo are brought to the stage for a delightful hour of nostalgic laughter. “Since Curtis’s comic persona closely resembles Gracie Allen, the two score points on a delicious Burns-and-Allen style bit, with Sim … skilfully playing the straight man." 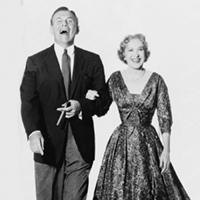 The great comedy duo of George Burns and Gracie Allen are brought back to life by Stephen Sim and Caity Curtis who share the chemistry of the vaudeville/radio/tv pair. It is great to see how the comedy from that era still holds up today. The duo also update a few bits and then perform an improv version of a TV episode based on suggestions from the audience. You can tell Stephen’s banter with the crowd in soliciting the suggestions from the audience plays on his long experience with improv troupe CRUMBs. Caity also adds some lovely humerous numbers on the ukelele. For those that saw the show last year, they do re-use a couple of the best bits from last year, but I enjoyed seeing their updated take on Abbott and Costello’s “Who’s on first” routine and the “Pick a card” bit again as they are both so well done.